We are passionate about sharing our vibrant community and providing you with an authentic Bend experience that truly immerses you in your destination! Our creative business culture supports a healthy work-life balance with flexible scheduling and collaboration with a sense of purpose in caring for both our guests and our community. As outdoor enthusiasts we care for our wild places and love to get out on the river or up on the mountain for a sunny bluebird day! Bluebird Day homes absolutely sparkle! That's because rather than following the industry standard of outsourcing cleaning and maintenance, we employ our team members. This gives us exceptional quality control while providing our hard working team fair living wages, flexible scheduling, liability protection and most importantly-- a great sense of pride and purpose in the work they do! We use only environmentally friendly products that are easy on the planet and safe for our guests and team members. A lifetime traveler and explorer, Paige Robinson is passionate about creative, collaborative entrepreneurship that supports and uplifts community. With a background in design, she has a knack for drawing the unique character out of a property transforming it into a one-of-a-kind, top performing vacation home. As a veteran of the spa industry, unsurpassed customer service is her second nature, and a hallmark of Bluebird Day. Paige is a member of the Visit Bend Board of Directors representing Bend's Vacation Rental Industry. She collaborates with Bend leaders in tourism to ensure that visitors are encouraged to understand and value Bend culture, shop and dine 'local', and take care of Central Oregon's wild places. She is an active voice and instrumental leader in interconnecting local businesses strengthening the vitality of the social/economic fabric of the Bend community. "We met the Bluebird Day gals when we made our first trip up to Bend, as we rented one of their fantastic homes. 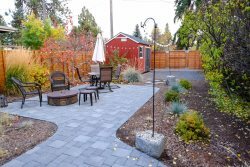 The experience was so good that when we decided to make a home purchase in Bend, Bluebird Day became the obvious choice to manage. Paige and her team even helped us furnish our home, they really have the design knowledge and relationships that allowed us to easily accomplish what is a difficult task, and save some real money in the process! When it comes to their management philosophy, they have a total commitment to quality and consistent execution on behalf of their clients. They really try to match tenants to your property. This was very important to us as we really were not interested in simply putting as many renters in as possible, but rather making sure that our home never looked like so many that show extensive wear and tear. The result is that after the first year of working with Bluebird Day, our home largely looks like it did when we first moved in! The bottom line, great service, a true partnership and a totally hassle free experience."